Ipe hardwood is nearly impervious to rot and insects, and can be sealed or left to weather naturally. By the beach we like to combine Ipe timbers with stainless steel cable for a durable and beautiful railing combination that will last a lifetime. 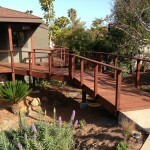 Ipe posts and dimensional timbers can be utilized for fencing or railings. The build can be challenging but the results are well worth the effort.